Disclosure: I received sample products to help facilitate the review. All opinions stated are genuine and my own. Super Duper Publications sells toys that are fun, and that inspire learning, creating a win-win situation for parents, children, and educators alike. If you take a look around their website, you will find a lot of really great choices for discovery, learning, and fun too! We were lucky enough to give some of their learning games a try. These pieces all separate and have a magnet on the back that holds fast to the dual board. 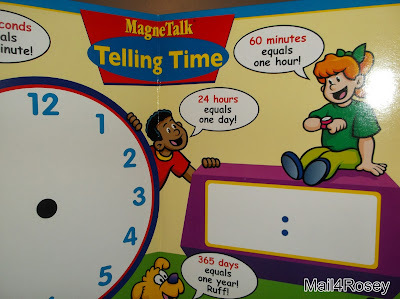 The MagneTalk Telling Time game was an instant favorite. It comes with a sturdy dual folding board that has a clock on one side, sans clock hands, a place to put numbers, and room to create a sentence (many 'clock' words are included to assist). This is how the board looks without any magnets on it. I am not sure if my son was just ready to learn to tell time, or if the format of the game made it easy. I suspect it was a combination of the two. Whatever the case, my little guy really made some great progress in learning how to tell time! 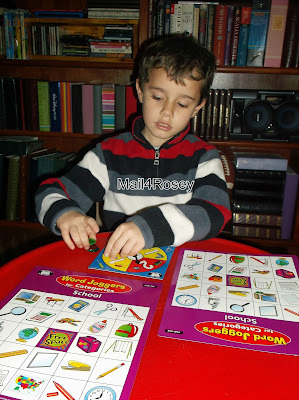 It was very appealing to him because he could arrange and rearrange the magnets to make different times; match those times with the magnetic clock handles; and create sentences out of words very similar to (and some the same as) the sight words he's practicing in school. that went along with the time he selected for the clock display. An example of a sentence he formed can be seen above. 8:30 PM really is his bed time, and he created that on the board with the clock hands, the actual number display, and the sentence above. Reinforcing how to tell time, x3 (the clock, number display, & sentence). The MagneTalk Telling Time game comes with its own sturdy, clear bag with handles. This bag makes clean up, & keeping up with all of the pieces a breeze! The MagneTalk Telling Time game is but one of many educational games at Super Duper Publications, and it sells for $21.95! 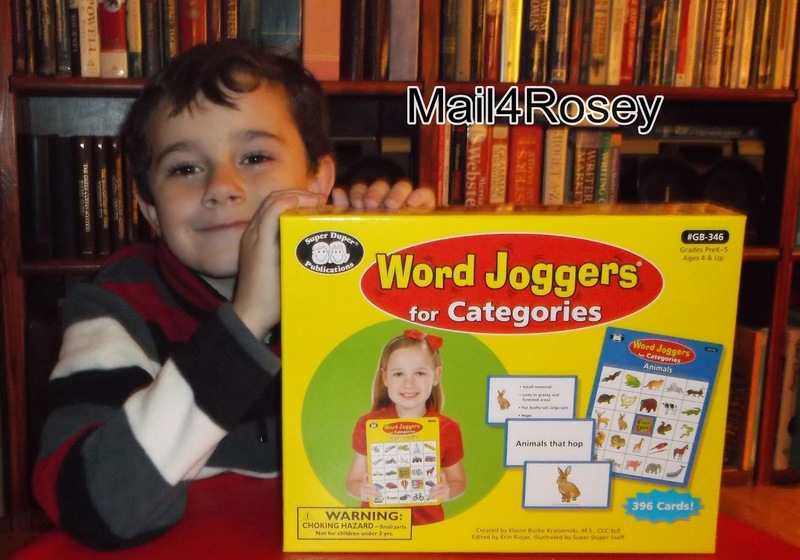 The second game we reviewed from Super Duper Publications was Word Joggers for Categories. 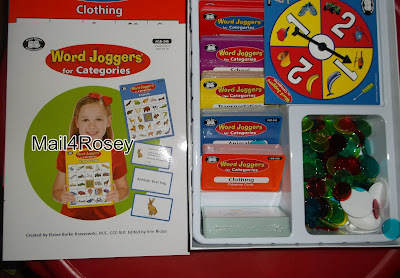 Word Joggers is an amazingly fun game that can be played in any number of ways. According to the description at Super Duper Publications, it is designed with students in mind who have specific language processing difficulty in grades Pre-K through the Grade 5, and students who are learning English as a second language. My son holding open the instruction book so you can see one of the ideas shared for playing. 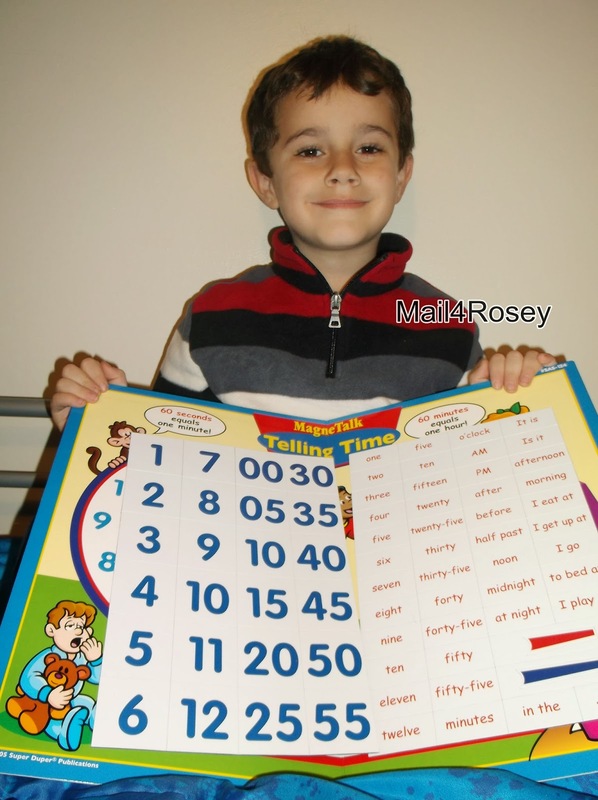 The pictures on the over-sized BINGO cards are familiar, colorful, and large. Just right for generating interest and keeping a little one's attention. The game is similar to BINGO in many ways, but steps it up a notch or ten to be even better (and you already know that Bingo is fun in and of itself!). 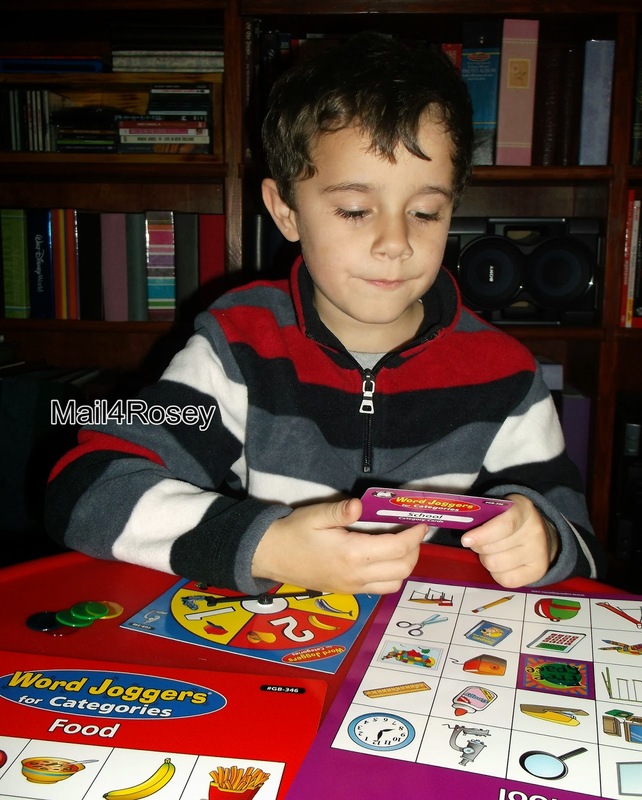 Offering three sets of cards (Categories, Attributes, and Vocabulary) the game can be mixed and matched to help you focus on areas your child might most need practice, repetition, and/or learning. 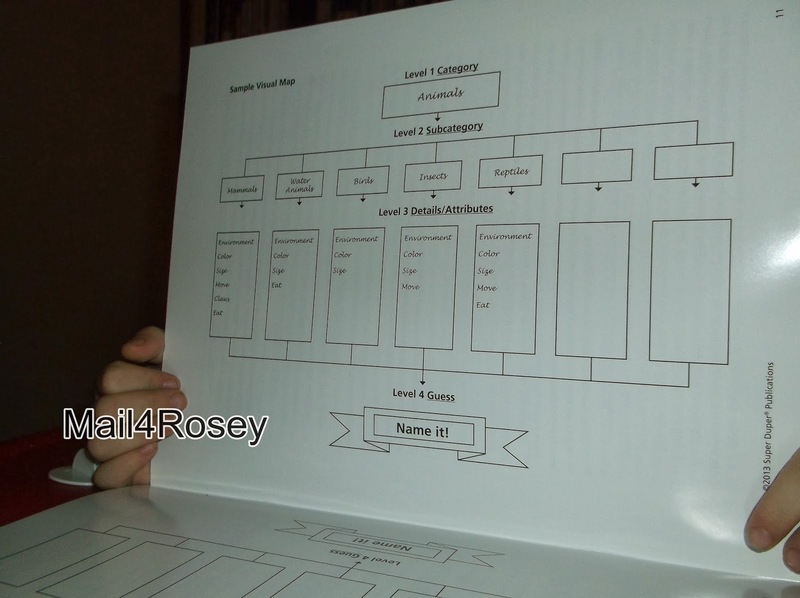 Games can be adapted to most any environment (school, home, clinical), and sorted/created by level of difficulty. We chose to create a BINGO game out of the category cards alone for our first game. 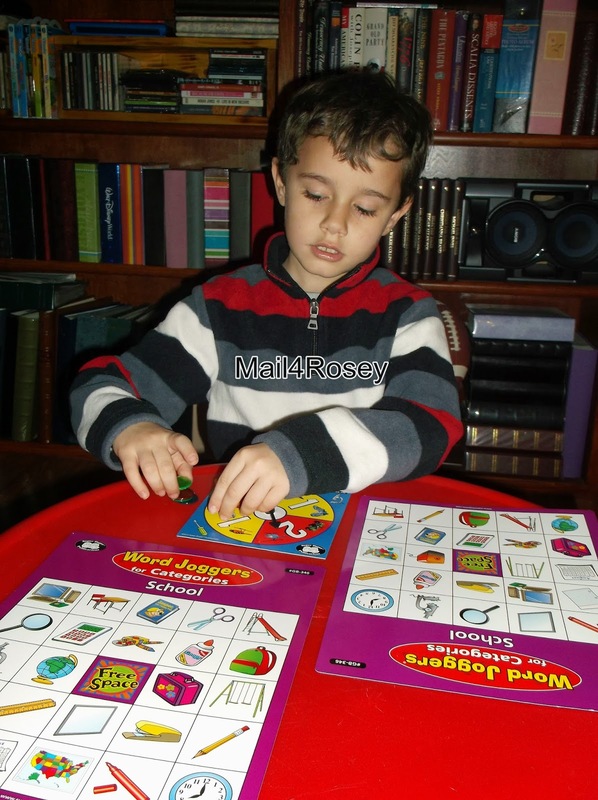 The cards were great because they offered easy to read sentences that got my son thinking, and best of all, practicing his reading!! 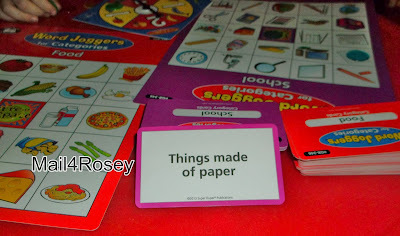 The first card he drew said, "Things made of paper," and he spun a #2 on the spinner. So... he had to put a BINGO chip on two of the items on his card that were made of paper. The game continued along in that fashion until one of us achieved a line all the way across, up and down, or diagonally. I drew from the "Food" category that matched my card, and my son drew from the "School" category that matched his card. We could have both used the same type of category card. That's the beauty of the game, you can create and enjoy as many different types of scenarios as you can think of (and for my youngest, that is a big part of the fun). This game was a big hit in our house, and we have played it almost every single day since it arrived. The two games reviewed here or just a small selection of the many great learning/fun items you will find at Super Duper Publications. You can learn more about them and their products by visiting their website. You can also follow Super Duper Publications on Facebook, Twitter, Pinterest, and/or YouTube. There are also two great promos going on right now. The second offer is 15% off using the promo Code: DEGRVPJR (good through Dec. 20). Shipping to US and Canada is always free for orders over $20. Super Duper Publications is a great place to shop any time of the year, but with the holidays coming up, it's even more appealing to me. 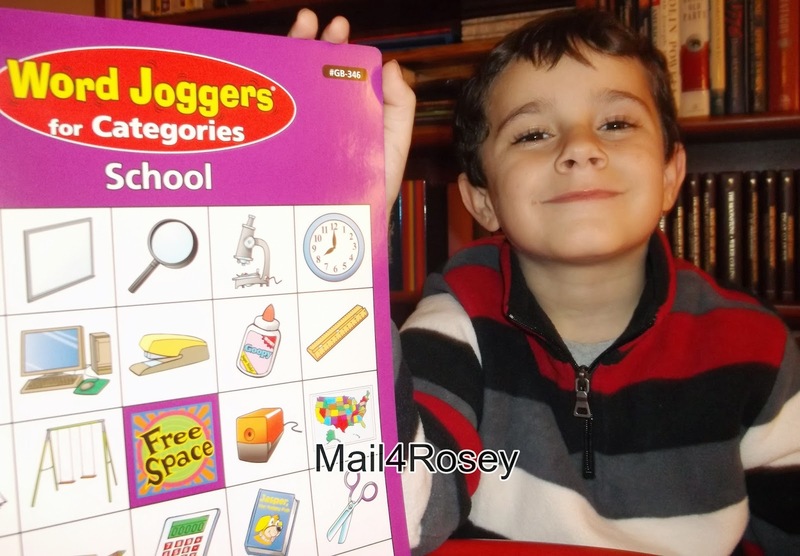 I love to shop for gifts that children like, and learn a great deal from too! I hope you'll go check them out, I am certain you will find something you love. Allison would love that clock and bingo set! 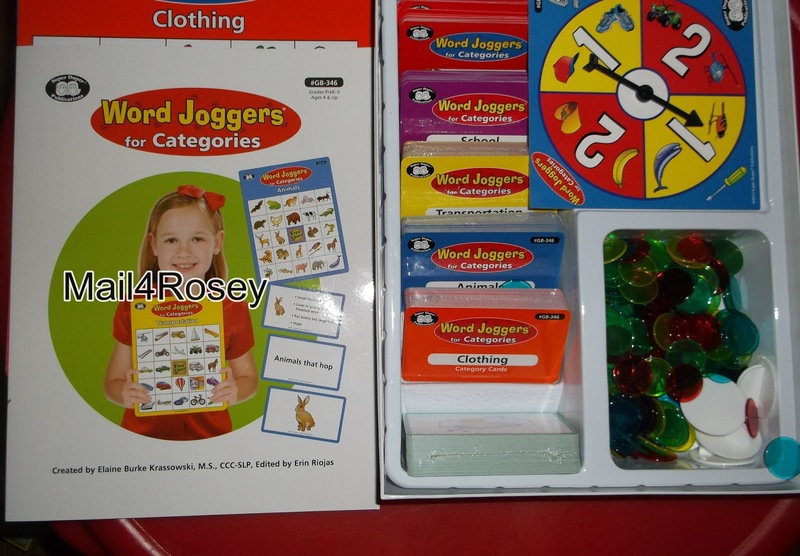 She loves to play school at home, and these would be great for her to play and learn with! I flat out love both of these. :) Thanks for reading, Theresa! What a fun way to learn to tell time and words! Your son really looks like he is into it totally! He had a great time with these toys! Oh my kids would love this for sure. I definitely need something to help teach my young ones how to tell time, and this would definitely work well for them. Thank you for the very detailed reviews including the video. What a fun way to learn how to tell time. There are a lot of kids that have no idea how to really tell time with a clock. They can only use a digital one. I love Super Duper! They have such a massive selection of awesome educational items! Don't they have a huge inventory??? I'm glad you're familiar with them, it's an exciting company. I loved doing this review. I love these educational materials. My daughter is learning time and this would be perfect. I have a little foam clock that we use to practice, and even with our other regular clocks. Thanks for sharing about this company! That MagneTime is a great way to help learn how to tell time, the magnetic backing make it easy to change things up too. I really, really liked that set!! 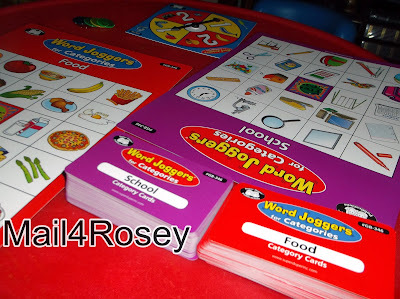 These all look like great learning games that my children would love! I found a bazillion things I loved on that site. :) Thank you for your visit! I wish I had know about this site when my special needs daughter was younger! Right now, these would be great for my little nephew! I am homeschooling a pre-schooler and need all the resources I can get. I will check these out. These look lovely good for the kiddies ours would love these. Highly recommended here, I have nothing but good to say about their co./products. :) Thank you for visiting! 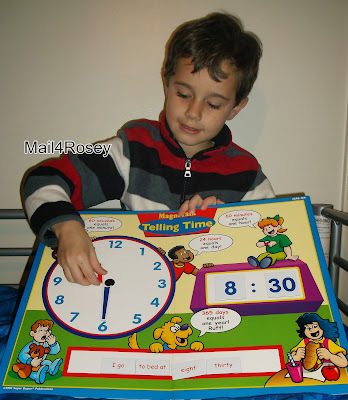 My son (the little one) is learning how to tell time in school, so that board would be PERFECT for him. It's reasonably priced too! I like that one a lot! Thanks, Sarah-Louise. We had a lot of fun with what we reviewed! Super Duper Publications has some wonderful educational resources. Especially love that they design books for children with learning issues. Wish they were around when my middle one was in elementary. I've never heard of Super Duper but thinks this is a great service. I will have to look into this for my library kids. It's really an awesome resource to know about! broxton is trying to learn time now.. These are the kinds of games that I always bought. I used to shop at teacher supply stores for educational things. I've never seen a clock with both types of displays though. This one is excellent! It's important they know how to tell time no matter what it looks like. I love super duper publications! They have such great materials for teaching our kids! I love that these publications inspire learning and have beautiful illustrations to address all of the learning modalities. My daughter is just about the perfect age for this! I thinks he would really like it. Games and learning should go hand in hand more! I love it! I wish I had a set of these when I was teaching first grade. It would have been a good activity for the kids to play when they finished work early. I don't have little ones anymore but this would have been a big help. I love fun educational toys. I think this is so cool! My daughter is getting up in age. and this could come in handy with her! Looks like they make such awesome games that not only they are having fun but learning at the same time. Love games like that. My son is learning to tell time right now, too, and this triple-hit in learning would be great. I love that they're magnetic. He gets so frustrated when pieces fall off or move from he put them. This looks great for homeschooling. I love how big the numbers are. 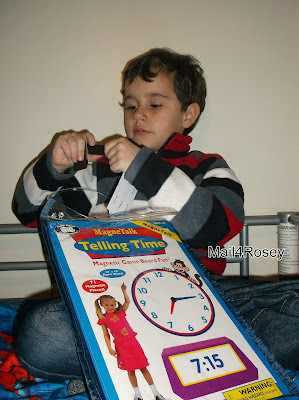 I've never heard of Super Duper Publications, but I absolutely love this telling time game!